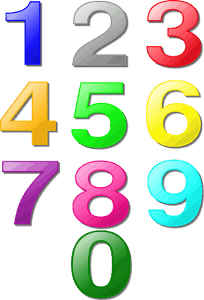 You have come to the right place if you are looking for fun, engaging and exciting Numbers themed activities to do with toddlers, preschoolers and kindergartners. Our activities are widely used by teachers, moms, dads, child care providers and more! Have the children bring in a baggie full of 100 of something marshmallows, M&M’s, buttons, pennies etc, that they first had to count at home with someone, then we would count it again with them during class. What ever was edible was shared at our 100 day party. We also made crowns that they decorated and glittered a 100 on the front, then we practiced making lines and circles that day. I give the children bags of 100 fruit loops and they string necklaces. Have the children bring in a collection of 100 things and use them to make a picture/collage. Photograph each child with the finished product. Send home a large coffee can (decorated). Instruct the children and parents to bring in a number different things that would fit in the can. Each child would be assigned a different number. At circle time, they would sit in front of the class and give clues to what was in the can and the children had to guess what it was. Pour salt into a shoe box. Have the children trace numbers in the salt. Make a paper chain and add a chain each day you are in school until you get to the 100th day. Or you could reverse it – have the chain of 100 links ready and take one off each day of school and have a count down.